Would he be showing up to church impeccably groomed and dressed in the latest fashion statements. If you look at scripture it tells you what he would be doing. He would be doing crazy things. All because he loves crazy people. He loves the unloved, the outcasts. He would be tipping religious cows. He would mess up crazy religious ideas. He would stand up to and challenge people you think someone must be crazy to challenge. He would be messing with the minds of the respected theologians, he would rock the proverbial theological boat. He would take sacred doctrine and turn it upside down and sideways. It’s so easy to be in the safe section of mainstream Christianity, but decide to walk and act like Christ YIKES. Watch out you will most likely be called a crazy hieratic. 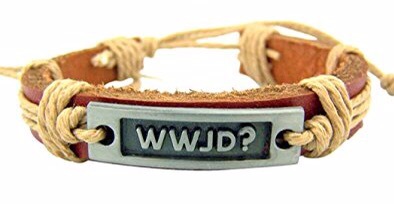 It makes a great saying for a wrist band but are you prepared for the real answer? Are you really asking and desiring a real answer? If you are then be prepared to have your world rocked. Be prepared for a cosmic shift in your entire belief system.